This just in time for Monday Night Football! Like it or not, Football season in the United States is ramping up and with all the teams in pre-season action, fans are eager for any kind of news about their favorite players. Even felines have their place with one division, made up of the Jacksonville Jaguars, Cincinnati Bengals, Carolina Panthers and Detroit Lions, being referred to as “Big Cat,” a little (or big, depending on your commitment to Monday Night, Thursday Night, and all day Sunday games) something for those that keep their kitty alliances strong across all sectors in life. Of course, alongside the games come the volumes of interviews of players when sports reporters venture into the human-interest side of players; their interests, likes and dislikes, and how they spend their leisure time. Occasionally there is an unexpected bit of adulation for our furry friends. Such is the case with on Los Angeles Ram’s player. ESPN: What would you list as your dislikes? GURLEY: Driving. Waking up early. And I hate dogs. I love cats, though. Cats are so cool. Actually, I’m probably gonna get some this year. ESPN: Sorry, you’re gonna get a bunch of cats? 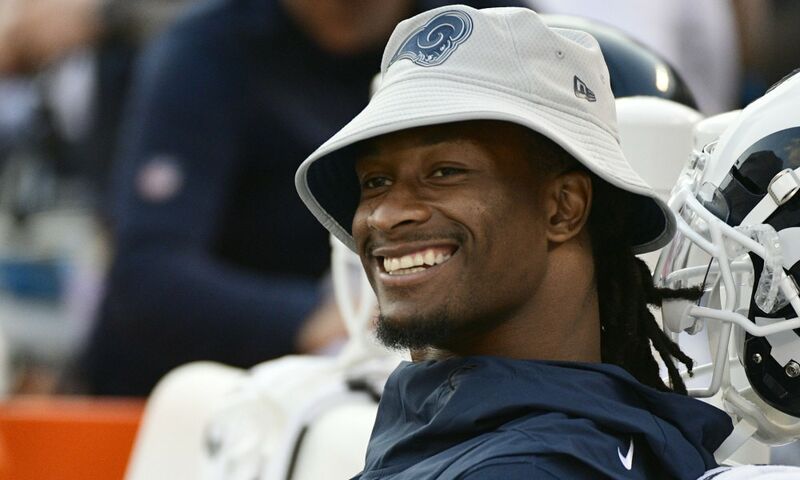 GURLEY: Two, at least, so they can, you know, conversate or whatever. I mean, how would I feel if I was a cat and someone bought me and just left me by myself for like 20 years? ESPN: So, you’re the Crazy Cat Lady. GURLEY: Yeah, I’ll be Cat Dude. Phil Taylor may have the same affinity. When he was with the Denver Broncos the six-foot-three inches, 335 pound Defensive Lineman snuggled with kittens during “Adopt-a-Shelter-Cat” month in an effort to bring awareness to the love just waiting for new homes, while according to Craving Catnip, Oakland Raiders Running Back Doug Martin and New York Jets Linebacker Kevin Pierre-Louis are also cat fanatics. We suspect there are more guys in the locker room who are also “Cat Dudes.” Maybe Gurley has let the cat out of the sports bag.